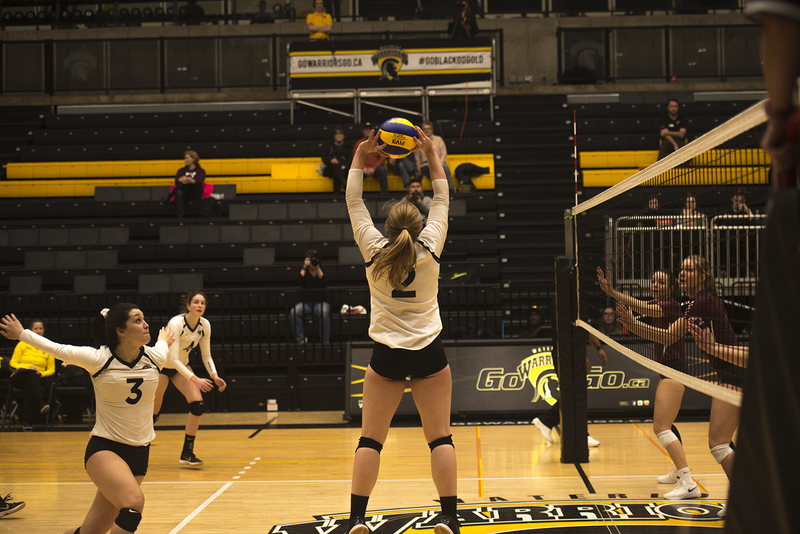 On Feb. 2, the women’s volleyball team defeated the McMaster Marauders to remain undefeated. The win brings the Warriors to a record of 14-0 of the season, first in Ontario. The team is currently ranked fifth in the country. The women began the game dominating the first set 25-19, thanks to quality sets from Claire Gagne, and strong outside hitting from Claire Mackenzie and Sarah Glynn. At one point up 23-14, the Warriors stumbled closing out the set as the Marauders went on a run to stay in it. McMaster rode the momentum into the second set, where they jumped out to an early seven point lead. The Warriors fought hard but couldn’t find a way to break the Maurauders’ strong defence, ultimately dropping the set by a score of 23-25. However, the women came out much stronger in the third behind pinpoint setting from Katrine Eistrat and a strong service run from Karen Fan, dominating en route to a 25-13 victory. In the fourth, Gagne and hitter Ella Stewart linked up multiple times and helped the Warriors put away the game with a 25-20 victory. Coach Richard Eddy dug deep into his lineup for the victory and was rewarded with strong performances by every Warrior that stepped onto the court. Fourth-year Samantha Warner led the game in kills with 19, while Gagne racked up 48 assists to bring her season total to 426, fifth in the province. It was a very strong defensive performance by the Warriors. Sarah Remedios led the way with strong serve returns and a team-high 16 digs on the night. Three other Warriors were in double digits, as Glynn, Mackenzie, and Brooklyn Gallant each finished the victory with 12 digs. Earlier in the week, the Warriors moved up a spot to become the fifth ranked team in the country because of their dominating play on the court. It was also the 20th annual Fantastic Alumni, Faculty, Staff and Retiree Day, as UW Athletics alumni were admitted free to the games (beginning with the basketball games earlier in the day). The event featured an Airplane Toss in support of the UWaterloo Wellness Fund, an annual tradition. The women will be back in action next Friday for their biggest game of the season as they square off against the defending national champions the Ryerson Rams (12-2) in Toronto. UW Athletics has organized a bus trip to allow students the opportunity to cheer on their undefeated team on the road. Where’s the soul in autotune?